Above: Hubert Wu, Kyle Li, Jarryd Tam, Telford Wong, and Alvin Ng star in TVB youth drama, “Wife Interrupted”. More than its criticized storyline, Wife Interrupted <救妻同學會> is currently receiving attention for its male cast. 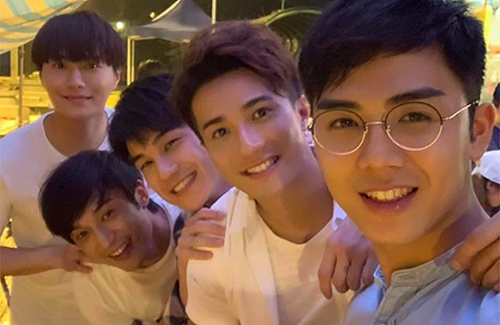 Initially hyped up with fan-shipped couple Hubert Wu (胡鴻鈞) and Moon Lau (劉佩玥), viewers are currently keeping an eye out on its five leading male actors instead. Debuting in the entertainment industry from winning first runner-up in The Voice 2 <超級巨聲 2> in 2010, Hubert has produced five albums with several songs being popular TVB drama soundtracks. Carrying the main role in Wife Interrupted, he is also the singer of its ending theme song. Challenging himself with acting in The Exorcist’s Meter <降魔的>, Hubert was widely praised for his performance and even managed to score a nomination for Best Supporting Actor in the 2018 Asian Television Awards and 2018 TVB Anniversary Awards. It is his first time to carry the main lead in Wife Interrupted. Alvin Ng (伍富橋) debuted through The Voice Season 4 <超級巨聲 4>. Initially starting off as the main host of TVB’s entertainment news corner, he later signed with Hubert’s record label, Voice Entertainment in 2016. Looking fit as a police officer in Wife Interrupted, Alvin enjoys being active and often posts photos of himself working out at the gym on Instagram. Joining TVB in 2016, Telford Wong (黃庭鋒) is perhaps the least known out of the five, as he used to host now a sports program. He had headed the show with his tallness, good looks and possession of a Master of Physical Education. But despite being the least-known, he has the best luck, with him winning the top prize at TVB’s 2018 Anniversary Gala Show, which was worth $510,000 HKD. A familiar face across many TVB dramas including Daddy Cool <逆緣>, The Stunt <特技人> and the recent OMG, Your Honour <是咁的，法官閣下>, Jarryd Tam (譚永浩) had also participated in the popular franchise, Hearts of Fencing 2 <赤沙印记＠四叶草2> when he was 16. In 2004, he had won first-runner up at Emperor Entertainment’s New Talent Singing Competition, but this sadly did not progress his career. However, with his role in Wife Interrupted, it appears he may gain greater recognition. Wife Interrupted is Kyle Li‘s (李任燊) first TVB drama. He started out winning the UStar Most Popular Male College Student and Online Popularity UStar Boy Award in 2011. A rising star in the film industry, he played the main lead as Stephy Tang’s husband in Somewhere Beyond The Mist <藍天白雲> and gained praises for his performance. Based on the photos above, I like Telford Wong the most. He is the handsomest one among the five, and is tall and has a good built physically. He looks very sharp with his eyes. If he learns how to act well, he has a lot of potential to move up to 1st lead roles in 1 or 2 years’ time with the current TVB’s shortage of actors.